Aside from visas, passports and local currency, one of the more pressing concerns when traveling abroad is ensuring that you will be able suitably power and charge your various portable electronics. Different countries around the world use different types of wall sockets and the type of electricity delivered by these wall outlets can vary too. It is important to educate yourself about power needs at your destination before leaving home. When traveling internationally, power and charging considerations can be broadly summarized into two main points: (1) voltage range and (2) sockets/plugs. These will dictate the types of power accessories you will need to pack when visiting a foreign country. In the United States, standard wall outlets output electricity at 100-120 volts (V). While many countries around the world also use 100-120V power outlets, numerous others use outlets that output electricity at 220-240 volts. These are not compatible with one another and it can be very dangerous to plug a device that needs 100-120V into a wall socket that delivers 220-240V power. To address the difference in voltage at your destination, you may need to purchase a voltage converter, sometimes called a 220 to 110 converter plug. The Insignia All-in-One Travel Adapter/Converter from Best Buy is one such product. It plugs into a socket that delivers 200-240V electricity and steps it down to 100-120V to be compatible with devices that need that type of electricity. A voltage converter is only necessary if your device will only accept 100-120V electricity. When you look at the charger or power adapter for your device, there is always a label that states what 'input' it will take. In the case of many common consumer electronics, like notebook computers, the power adapters will accept 100-240V electricity, meaning that a voltage converter is not necessary. In the United States, the vast majority of typical wall outlets look the same. There are two vertical slots next to one another, plus a semi-circular port underneath. Some plugs have just two vertical prongs (one of which is sometimes slightly larger than the other), while others fill all three slots. These plug types are also used in some other parts of the world, but there are many other plug and outlets standards used internationally. To address the difference in sockets and plugs, proper travel adapters may be required. Unless specifically stated otherwise, these travel adapters do not convert voltage. All they do is accept the plug from one device and adapt it to suit a different power socket. Some travel adapters are designed specifically for one socket type, like the eForCity US/EU to Australia power adapter from Amazon. Others, like the International Travel Adapter with USB charger from Walmart, have the option to work in many different socket types. The various plug and socket types used around the world are outlined by the International Trade Administration of the U.S. Department of Commerce. For ease of reference, each plug and socket type is assigned a letter and there are at least 15 different types being used today. While some plugs are used in many countries, others are used only in one country. For example, Thailand is the only place where you will find the Type O plug, which looks like three circular prongs arranged in a particular triangular formation. Each socket type also corresponds with the voltage range the power outlets deliver. Type O outlets always deliver 220-240V electricity. Type A: Two vertical prongs; not grounded; used mainly in North America. Type B: Two vertical prongs with a rounded third prong; grounded; used mainly in North America. A comprehensive list of the plug types and voltage ranges used in each country can be found on the WorldStandards.eu website. To charge a smartphone in Taipei, Taiwan: No adapter or converter is necessary, as power sockets in Taiwan are also type A/B with 110V/60Hz electricity. Typically anything within the 100-120V range is fine. To charge a laptop in Paris, France: A voltage converter is typically not necessary, as most modern laptop power supplies support multi-voltage. Check the label of your power supply to be sure. However, a plug adapter will be needed to convert an American-style type A plug to work with the type C and type E outlets typical of most of Europe. To power a desktop PC in Hong Kong: The power supply unit on most desktop computers can support different voltages, but you must select the correct input by flipping the voltage selector switch to 230V (sometimes available as 220V or 240V). The power cable won't work in a Hong Kong outlet directly, so you will need an adapter to suit the type G socket. To use an electric shaver in Tokyo, Japan: Japan uses 100V power outlets with 50/60Hz and the same type A/B sockets as the United States. This is slightly less power than a typical American outlet, but you should be able to use your electric shaver directly with no issues. To use a hairdryer in Buenos Aires, Argentina: Most hairdryers are not multi-voltage. Since Argentina's power outlets use either type C or type-I and deliver power as 220V/50Hz, you will need both a voltage converter and an appropriate plug adapter. To power a CPAP machine in Shanghai, China: Partly due to its complicated history, China uses three different power sockets. Type A is prevalent in modern cities like Shanghai, particularly in modern hotels and other areas where foreigners are expected, but type C and type I are also used. Also, power is delivered as 220V/50Hz. To ensure you can use your CPAP machine, it is recommended that you bring both a 220V to 110V voltage converter and a multi-plug adapter. To ensure your international vacation is as stress-free as possible, follow these handy power-related travel tips. Buy any voltage converters or plug adapters you need before you leave. 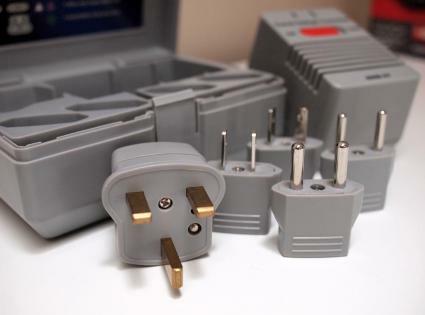 Most electronics stores carry plug adapters that accept devices local to the area, so it is easier to find the ones that you need to have in your home country. This also keeps you from having to go shopping for the right converters and adapters the moment you land at your destination. Consider using a surge-protecting power bar. By using a power strip, you only need to have one plug adapter and then you can plug in all of your devices into the power bar without needed more adapters. This is far more convenient than getting individual adapters for each device. Additionally, the surge protector will protect your electronics against fluctuations, inconsistencies and other possible concerns. However, do note that power bars are typically not multi-voltage. Get a power bar with the voltage needed at your destination and make sure any devices you plug into the power bar are multi-voltage. Charge USB devices through your laptop. If you would rather not use a power bar, your laptop can serve as a USB charging station for compatible devices like your tablet, smartphone and digital camera. Since most laptop power supplies are already multi-voltage, you only need to worry about having the right plug adapters. It cannot be stressed enough that you read the specifications for powering or charging your device very carefully before plugging it into a foreign power outlet. This label may be printed, engraved or embossed in some fashion. The label might be found on the device itself, on the power supply "brick" (like a laptop), or on the power plug itself. Cross-reference the compatibility with the electricity standards of your destination and be absolutely sure. Just because it 'fits' in the socket doesn't mean that you should plug it in there.